Open the Close dialog on a question. 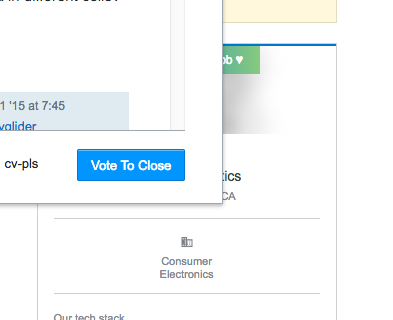 Position the "Vote to Close" button over the company logo in a job ad on the sidebar. Press the "Vote to Close" button. My close vote should be submitted successfully. The company jobs page opens in a new tab, and my close vote is not registered. The click event for the ad must be taking priority over the close button. Reproduced on an ad for Vantage Robotics. We had an issue with the "Learn more" button on Company Page Ads. While fixing that, I discovered that we were nesting <a> tags, which is kind of a "don't do that" thing and caused some weird issues with how the browser decided to render the ad. Fixing that involved overlaying the <a> tags for the various parts of the ad using z-index and position: absolute. Unfortunately, I picked a bad z-index value that was higher than the one used for the Vote to Close overlay. And since z-index is apparently global to the document, that meant that the CP ad <a> elements were rendered on top of the Vote To Close dialog and prevented interaction with the areas where they overlapped. The fix was essentially: use a smaller z-index value. It is building out to Prod now. Not the answer you're looking for? Browse other questions tagged bug status-completed jobs vote-to-close advertising .